We all joke about dropping everything and enrolling in Hogwarts. Some of us really did go to Hogwarts. 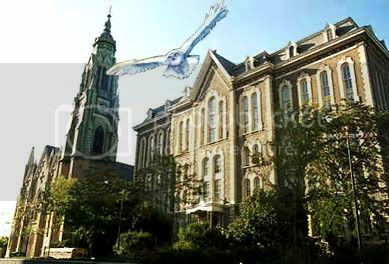 St. Ignatius Magical Prep is an American wizarding school nestled in plain view, 1076 W. Roosevelt Rd. Chicago, IL 60608 (feel free to sign them up for any mailing list you please, now). Oh, don't look so surprised. Everyone knows Jesuits are in league with the forces of witchcraft. Catholic? Ha! How many schools can claim to be over a hundred years old? Tradition is one of the great cornerstones of such institutions, and Ignatius and Hogwarts share such a mentality. I would not exactly call a certain president a match for Dumbledore, but I'm not, by any means, calling Ignatius and Hogwarts the exact same school. One must make allowances for how the British Ministry of Magic and the US Dept. of Magic run things. Ignatius and Hogwarts are friggin' castles and museums. Huge libraries with hidden nooks and crannies? Lots of artifacts and old pictures? Certainly. There beautiful chandeliers, you can walk up winding staircases to nowhere, and all the pictures will talk to you, at least once you've spent four years there. Ignatius flaunts a coat of arms like Hogwarts: odd for an American school to do that? Not if it's a wizarding school! Draco Dormiens Nunquam Titillandus (Latin: "Never Tickle a Sleeping Dragon")? Or Ad Majorem Dei Gloriam (Latin: "For the Greater Glory of God")? Now, I have to tell you a ghost story. One is about a guy who got his head mostly chopped off and became Nearly Headless Nick. The other is the founder of Ignatius Magical Prep and resides on the infamous Fifth Floor, which is odd because the school doesn't HAVE a fifth floor... though students swear to it. Now, I've never sat down to tea (or pranked) with Fr. Damen, but I'm pretty certain I could do so if I met him. He is supposed to be very friendly. There is only one place to buy your books, and they rip you off every time... though at least Hogwarts has Knockturn Alley for some secondhand books. We have to pray Amazon can apparate them to us the night before that 20-inch scroll is due. Perhaps some would say the most similarities came when Ministry Toad Dolores Umbridge took over Hogwarts. The Public Displays of Affection and Shirts Tucked In offenses shot through the roof. 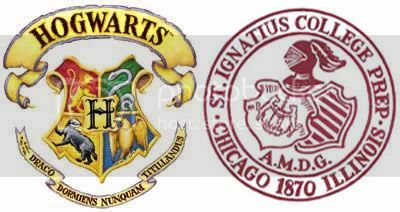 So Ignatius and Hogwarts are similar. When did I notice? Junior year, and yes, I did something about my observation. Here now is the only time I'll ever publish the only evidence I've ever written fan fiction: an excerpt from Joe Pacold and the Mathematician's Wand. "I assume, since you're a student, you'd want a bird?" asked Scritch. "Yes," answered Joe. Scritch looked just a bit disappointed. "Over here, then." Scritch led the Pacolds into the middle of what seemed to be a forest. "This is our bird sanctuary." Colorful birds fluttered overhead. Many pairs of bright eyes peered out of the trees at Joe. A few birds even landed right nearby to get a closer look at the people. Scritch motioned for several large birds to come closer, and they obeyed. "Well, whatcha think?" Scritch asked hopefully. "They're emus..." Mr. Pacold said. Joe could see his father was pretty sure Scritch was not accustomed to selling birds to young children. "And those are ostriches... none of those can fly." "They sure put off bullies, though!" Scritch laughed. "So, not those?" "How about these?" Scritch pointed at little brownish birds on a nearby tree, tweeting out various songs. One particularly ambitious one had begun a rendition of "My Way." "The song sparrows? Those would get hernias from letter-carrying," Mr. Pacold said, in a very serious tone. "Besides, who wants to wake up listening to an avian rendition of Sinatra?" "Do I really want to say what's wrong with a dodo?" "Point taken," Scritch said, looking agitated by the insistence of Mr. Pacold that these birds would not make good pets. He made a cooing sound, and a scraggly-looking pigeon landed on Scritch's shoulder. "Here we are." "A pigeon?! You expect my son to use a pigeon?" Mr. Pacold was looking more agitated than Scritch was. "I assure you that our pigeons are quite clean. And they do blend in around Chicago, I'd have to say." What about owls?" asked Joe. "Owls?" Scritch laughed. "Where do you think we are? ENGLAND?" Another pigeon fluttered down onto Scritch's shoulder. It was pure white. A PIGEON? Joe looked in a little disgust at the moldy bit of sandwich clutched in its beak, and certainly knew it was a pigeon. Other than the garbage, the pigeon glittered like pearl. "Our resident snowy pigeon... Like her?" Scritch finally seemed hopeful the Pacolds liked something. Joe threw a confused look at his father. Joe had wanted an owl. Instead, it looked like he"d be getting a pigeon, the kind of thing other kids' pets would eat. Okay, so this scene doesn't take place in Ignatius. Most of the scenes that I wrote back then were kind of too long or kind of sucked. The scene with the running pack of wolves statue at the front of the school was pretty awesome though (it asked passwords to get into a House dorm), and I planned to make the Wolf Gate into something awesome (and worth the million dollars it cost) as well. Why did I stop? Because it became too autobiograImeanboastful. It felt arrogant to continue writing, and I think the Pacold family gave a sigh of relief when I called it quits. And yes, after graduating, I can conjure a full Patronus like any trained graduate of the finest Midwest wizarding preparatory school. Guess what animal it turns out to be? 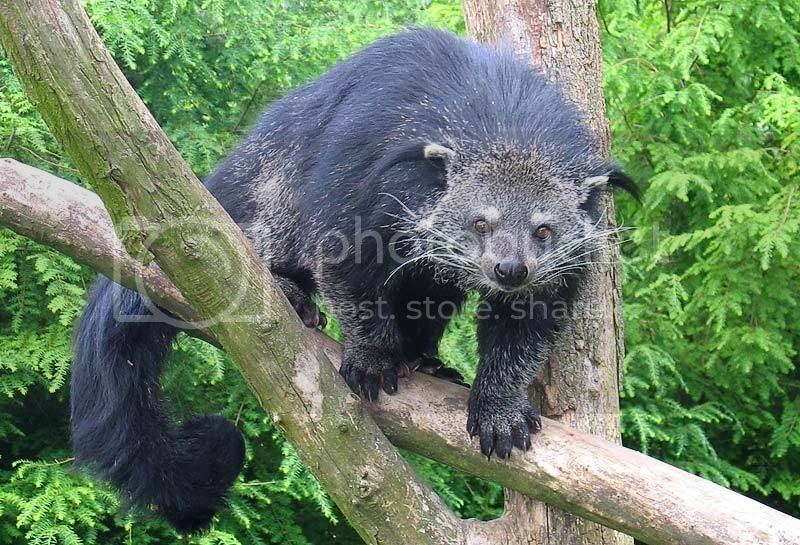 That's right: a binturong. Looks kind of like a teacher with tenure.